Minimal. With the HP 255, HP focuses on private and professional users looking for the cheapest possible work tool. A price of significantly below 400 Euros (~$549) is definitely "cheap." Our review reveals whether the notebook is also convincing. HP added new notebooks to the highly competitive market of cheap 15.6-inch notebooks with the 255 G2 series. The computers of this series feature the latest Kabini APUs from AMD. We compare our test model to the following competitors: Acer Aspire E1-572 (Core i3-4010U, HD Graphics 4400) and Asus F550CA-XX078D (Pentium 2117U, HD Graphics (Ivy Bridge)). Since the 255 G2 is technically identical to the already reviewed 250 G2 (Pentium N3510, HD Graphics (Bay Trail)), this article will not cover case, connectivity, input devices, display, and speakers in detail. Information about these is available in our HP 250 G2 review. The HP 255 G2 and the HP 250 G2 feature the same display. However, its rates are slightly different, which is normal. Two identical screens never correspond to 100%. Overall, the brightness is still below average and the colors are modest. 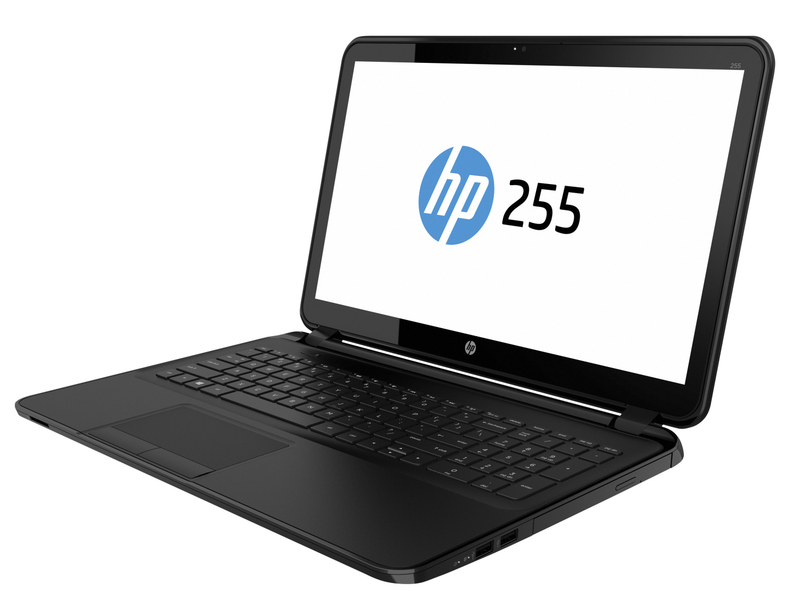 With the 255 G2, HP offers a simple 15.6-inch office notebook. The computer is suitable for simple tasks like surfing, Skype, text processing, and watching videos. It is available for about 370 Euros (~$508). According to HP's press release, they would offer many models. However, we could not find any other configuration at the time of testing. The 255 G2 features an E1-2100 APU from AMD's current Kabini generation. The CPU part of the APU consists of a dual-core processor clocked at 1 GHz. There is no Turbo, but the TDP is very frugal with just 8 Watts. The CPU can maintain its maximum clock in the Cinebench CPU benchmarks. The 255 G2 cannot keep up with its competitors. Their Intel processors are far superior compared to the AMD APU in single-thread as well as multi-thread applications. The system is rather slow. You will definitely notice the slow APU inside the notebook when launching applications or opening folders. Accordingly, the PCMark 7 result is not overwhelming. The F550CA and especially the Aspire perform significantly better. The 255 G2 features a hard drive from Hitachi's Travelstar series. It has a capacity of 500 GB and works with 5400 revolutions per minute. Overall, the results are throughout slightly worse than typical for 5400 rpm drives nowadays. The 255 G2 features the Radeon HD 8210 with a clock rate of 300 MHz. It supports DirectX 11.1. 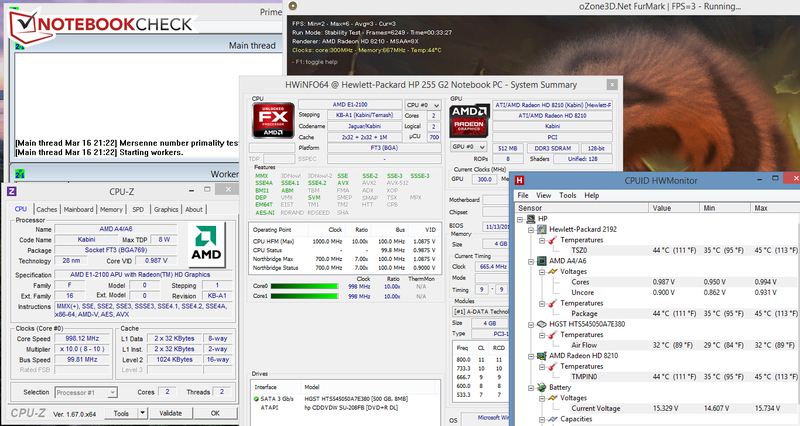 Its performance is on par with the HD Graphics (Ivy Bridge) GPU of the F550CA according to the 3DMark 2011 benchmarks. Neither competitor can keep up with the HD Graphics 4400 graphics core of the Aspire. The performance of the APU is virtually insufficient for computer games. The computer can at best run a few games with low resolution and low quality settings including Dead Space 3 and StarCraft II. The Aspire and the F550CA are not significantly different. Although the computer features a frugal APU, the fan runs continuously and audibly. This can get annoying quickly in quiet environments. The reason for the permanently running fan is a BIOS option found in many HP notebooks: "Fan always on" is enabled. Once this option is disabled, the fan is silent most of the time and only hard drive access is audible. The fan does not get especially loud under full load. The HP 255 G2 during the stress test. All three computers in our comparison feature frugal processors or APUs. As a result, the temperatures are in the green while idle and under load. Our stress test (Prime95 and FurMark for at least one hour) shows the full performance for the CPU and GPU, both with AC power and on battery (CPU: 1 GHz, GPU: 300 MHz). The CPU temperature leveled off at around 44 °C during the stress test. The AMD APU's TDP of 8 Watts is only half as high as the two Intel processors' (15 and 17 Watts), which means the HP is overall more frugal than the competition. While all three devices are comparable during idle, the 255 G2 performs significantly better than the Aspire and the F550CA during the stress test with a maximum power consumption of 16.4 Watt. Our practical WLAN test uses a script that refreshes websites every 40 seconds while the energy-saving mode is active and the display brightness is adjusted to around 150 cd/m². The 255 G2 achieves a runtime of 4:41 hours, which is okay for such an inexpensive and frugal notebook. The F550CA (3:26 h) has to be recharged much earlier. We could not run this test on the Aspire. 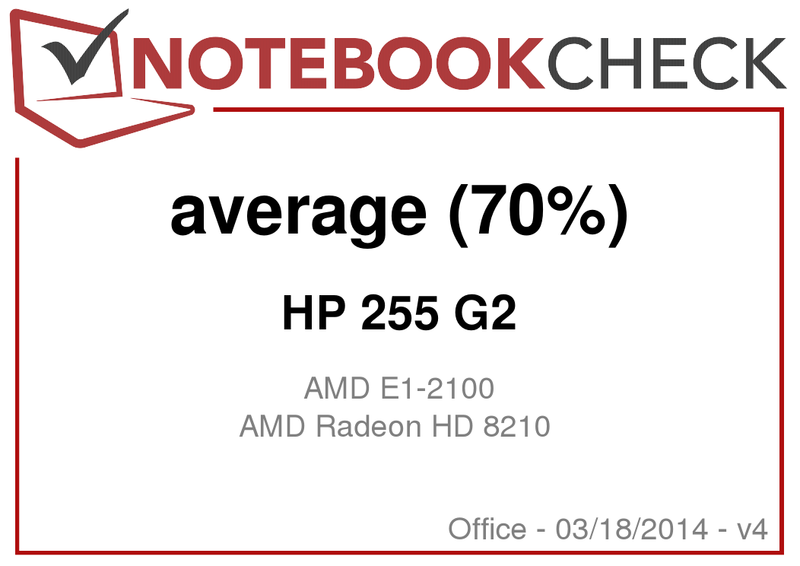 Because of its APU, the HP 255 G2 ranks at the bottom in terms of performance. It can be used for text processing, watching videos, Internet surfing and Skype. The notebook always works quietly - once you disabled the option "Fan always on" in the BIOS - and only requires little energy. In addition, the battery life is good in our realistic WLAN test. The matte display is also alright considering the price of the notebook. It has a good contrast and at least average brightness. Despite its pros, there is no real good reason to buy this notebook. Its biggest weakness is the slow APU. There are much faster notebooks available in the price segment of the 255 G2 including the Aspire and the F550CA and also the Aspire's sister model - the Aspire E1-532. The latter is already available from 250 Euros (~$343) - without Windows OS. The Acer Aspire E1-572 is not only an alternative to the 255 G2 because of its much faster CPU, but also because of its matte full HD display. The Asus F550CA-XX078D also features a faster processor. In addition, it is already available for about 320 Euros (~$439) - without Windows OS. Note: This test model was already rated according to the new rating system (v4), so the total rating is not necessarily comparable to that of older articles. The display is decent for the price range of the notebook. Acer Aspire E1-572, Asus F550CA, Acer Aspire E1-532, HP 250 G2, HP Pavilion 15-n050sg, Lenovo G500s, Lenovo G505s, Acer Aspire E1-522, HP Compaq 15-h024sg.